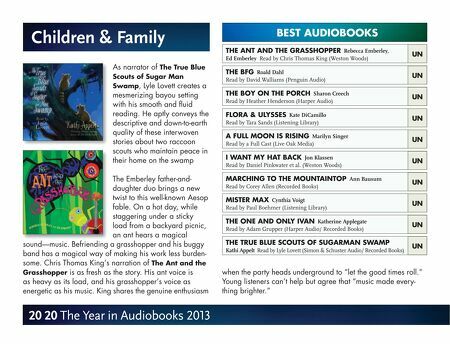 Children & Family BEST AUDIOBOOKS THE ANT AND THE GRASSHOPPER Rebecca Emberley, Ed Emberley Read by Chris Thomas King (Weston Woods) As narrator of The True Blue Scouts of Sugar Man Swamp, Lyle Lovett creates a mesmerizing bayou setting with his smooth and fluid reading. He aptly conveys the descriptive and down-to-earth quality of these interwoven stories about two raccoon scouts who maintain peace in their home on the swamp The Emberley father-anddaughter duo brings a new twist to this well-known Aesop fable. On a hot day, while staggering under a sticky load from a backyard picnic, an ant hears a magical sound—music. Befriending a grasshopper and his buggy band has a magical way of making his work less burdensome. Chris Thomas King's narration of The Ant and the Grasshopper is as fresh as the story. His ant voice is as heavy as its load, and his grasshopper's voice as energetic as his music. King shares the genuine enthusiasm 20 20 The Year in Audiobooks 2013 UN THE BFG Roald Dahl Read by David Walliams (Penguin Audio) UN THE BOY ON THE PORCH Sharon Creech Read by Heather Henderson (Harper Audio) UN FLORA & ULYSSES Kate DiCamillo Read by Tara Sands (Listening Library) UN A FULL MOON IS RISING Marilyn Singer Read by a Full Cast (Live Oak Media) UN I WANT MY HAT BACK Jon Klassen Read by Daniel Pinkwater et al. (Weston Woods) MARCHING TO THE MOUNTAINTOP Ann Bausum Read by Corey Allen (Recorded Books) MISTER MAX Cynthia Voigt Read by Paul Boehmer (Listening Library) THE ONE AND ONLY IVAN Katherine Applegate Read by Adam Grupper (Harper Audio/ Recorded Books) THE TRUE BLUE SCOUTS OF SUGARMAN SWAMP Kathi Appelt Read by Lyle Lovett (Simon & Schuster Audio/ Recorded Books) UN UN UN UN UN when the party heads underground to "let the good times roll." Young listeners can't help but agree that "music made everything brighter."